It’s almost been two weeks since GSK made a $300 million equity investment in personal genomics and biotech company 23andMe. And let’s just say the feedback has been mixed to say the least. When the press release broke I read on with interest about how the collaboration could potentially pave the way for new drug target discovery programs. In particular, targeting consenting 23andMe customers with a leucine-rich repeat kinase 2 (LRRK2) variant to help expedite development of GSK’s LRRK2 preclinical candidate in Parkinson’s disease (PD) can only mean the right patient gets hold of the right drug sooner, surely? Only 10,000 out of a total 1 million PD patients have the disease caused by LRRK2. Finding those patients through the (normal channels) used for clinical trial recruitment can therefore (be very tricky/pose a challenge). The collaboration however, presents a potential solution for this, using the data available to 23andMe and their ability to use this to highlight appropriate patients. 23andMe are then effectively handing over 250 consenting PD patients with the LRRK2 gene variant for potential clinical trials, which could / should expedite the whole clinical trial recruitment process. So all good then? Not exactly. The key word in the above is consent. 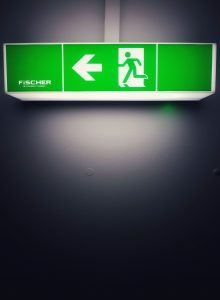 Whilst the communication to the so-called 250 consenting PD patients may well have been handled correctly, with research advancements in mind, it seems that the rest of the 23andMe community have not taken to this news as would have been expected. 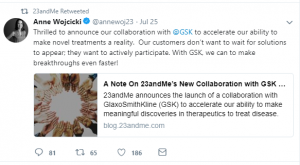 Anne Wojcicki, co-founder and CEO of 23andMe published a blog on the collaboration on the 25th July, with the usual pomp and ceremony that accompanies any collaboration with a global big-hitter. This blog was met with several very highly charged and emotional #optout requests – 7 out of 15 comments in fact (at the time of writing), with only 2 optimistic comments regarding the new collaboration. Twitter was equally a hot-bed of dissension. where was my opt-in option? was the general gist of the responses. Yes, the customers, buoyed by each other’s comments, hit that frenzied keyboard warrior rage that seems all too common (and easy to do) these days. It’s easy to find fault in almost anything new. And social media is an easy platform from which to launch a distant attack. 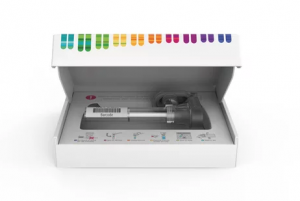 This case does feel a little different though, with genuine betrayal felt by 23andMe customers, and more alarmingly a lack of information sent to these CUSTOMERS (let’s not forget that word!) to explain the (good) intentions of the collaboration. Let’s hope that this isn’t the first nail in the coffin for genuine scientific collaborations between 23andMe and drug development companies, and a further nail for pharma reputation.